Preview designs and density of quilted lines using QUILTER'S PREVIEW PAPER; when you SEE it, you'll recognize which designs complement and enhance your quilt (and which designs don't). Scroll down to see how. Quilter's Preview Paper is printed with a line on the edge to define the boundaries of the drawing surface. Clear films are so clear, you can't see the edges. Do you want to risk drawing off the surface onto your quilt? Yikes! Lay Quilter's Preview Paper on project or design to be traced. Advance paper to draw another design (view multiple designs prior to choosing final). Use Quilter's Preview Paper to determine placement of quilting design and to see where thread will lay on your project. The heart motif and triple loops are nice elements and fit the piecing of the block. The design isn't large enough but could be echoed between the design and the block edges to fill up the space. ​Look at the line from the heart to the triple loops. See that the line crosses from dark to light to dark to light fabric. What happens if you use white thread? The design lines in the white fabric will disappear and the lines in the dark fabrics will scream, leaving an awkward looking quilting design. The opposite happens if dark thread is used. If this design were used, monofilament thread would be the really the only choice. We loved the design on paper. ​This design competes with our patchwork and does nothing to complement it. Even if we enlarged it, it has the same thread color issues as Design 1. Design complements block, doesn’t compete with it. Quilting lines could be quilted with thread to match individual quilt patches (white thread in white, yellow in yellow, etc.) because no one line arc crosses from light to dark except through an intersection of the seams. 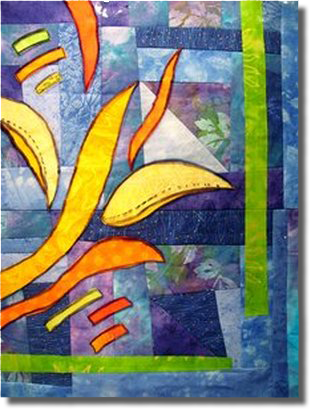 Lines can be drawn onto quilt block with a chalk pencil or other erasable marking tool. ​Nothing. This is the design we would choose. Trace design onto Quilter's Preview Paper using permanent marker. Cut Quilter's Preview Paper about 2" larger on all sides of design. To perforate, free motion machine stitch along the design with large unthreaded needle (size 90 recommended). Clean or change your needle before it using on fabric. Place perforated Quilter's Preview Paper on project. Mark using chalk pounce or cotton batting dipped in loose chalk. Work chalk into perforations by rubbing pounce or batting over the perforations. Marking works best when project and paper are on a flat, hard surface. Because of variations in temperature, humidity, markers, and other factors, test all markers used in this process. Mark on scrap fabric first. *We highly recommend using the Miracle Pounce Pad filled with Miracle Chalk. If using blue chalk as shown in the picture, use a lint brush to remove excess chalk from fabric. Trace appliqué design onto Quilter's Preview Paper. Place appliqué onto background fabric piece by piece, checking for accurate placement by laying Quilter's Preview Paper over your appliqué. Adjust appliqué as needed. Do not iron Quilter's Preview Paper!